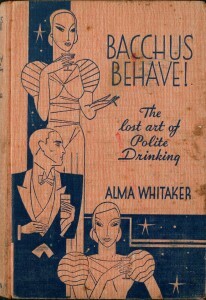 Los Angeles Times’ gossip columnist Alma Whitaker wrote the lovely, witty tome on post-Prohibition drink and drinking—Bacchus Behave! The Lost Art of Polite Drinking—adding with more than a few blurbs from film director Rupert Hughes, actors Clark Gable, Charles Chaplin, Marie Dressler, Tom Mix, and blockbuster producer Cecil B. De Mille.